I am very particular about the nutritional supplements that I take, especially those that target weight loss. I recently discovered the new Fembody Nutrition line which appeals to me because it is designed specially to meet the needs of women with naturally based formulas. I decided to try to products in the line including Slim Select 30/90 and Appetite Control 100. Slim Select 30/90 is designed to support a weight loss program and includes natural ingredients like Green Select® Green Tea Extract, InnovaTea™ Natural Tea Extract and Raspberry Ketones. I really like that I did not have any jittery feelings despite the fact that this product does have caffeine in it. The product suggests that it has been clinically shown to “demonstrate average weight loss of 30lbs in 90 days.” I have taken it as directed for one month and along with healthy eating and exercise program have steadily lost a total of 6 pounds. I would definitely continue to take this product because there were no unpleasant side effects and I did see positive results from personally using Slim Select 30/90. I really like the product, Appetite Control 100 because despite the fact that I eat healthy, whole foods I find myself snacking in the evening even when I am not necessarily hungry. In the end….a calorie is a calorie and if it is not needed then it turns to fat. The Appetite Control 100 was quite helpful for me because when taking this supplement, I don’t even want to snack at night and instead drink hot tea or lots of water. What is the “secret” of this product? 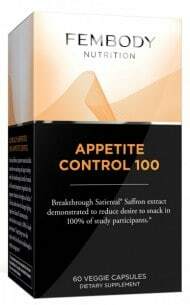 It uses Satiereal® Sa-ffron extract which is “demonstrated to reduce desire to snack in 100% of study participants.” I am not an expert by any means but I do know when something works for me and I am pleasantly surprised with how well this helps me to control my desire to snack at night. If you are looking for a natural supplement line that has been designed specifically for women then I recommend visiting the Fembody Nutrition website to learn more about it. This line is available exclusively at GNC stores or you can purchase it online now…..check out how you can receive great savings of up to 50% off by redeeming your coupon! Two lucky readers will receive a bottle of Appetite Control 100! It helps 100% of women decrease their appetite, and 80 % to lose more than 11 pounds. It’s also all natural. DECREASE in snacking. sign me up. following via email and facebook. I learned that 80.7% of women taking Satiereal lost weight, with a maximum of 11 lbs lost in two months. I learned that “80.7% of women taking Satiereal lost weight, with a maximum of 11 lbs lost in two months”. It’s stating that 100% of Women Taking Satiereal Report Decreased Hunger…. makes this very tempting to try! I learned Satiereal® is a non-GMO proprietary extract of saffron clinically proven to create satiety and help prevent snacking and compulsive eating behaviors which support reduction of both weight and inches. I learned that 100% of women who took the product reported decreased hunger! I learned that Satiereal’s unique mechanism helps improve levels of the neurotransmitter serotonin, which increases the satiety state while decreasing appetite. I learned that 80.7% of women taking Satiereal lost weight! Awesome! i learned that 100% of Women Taking Satiereal Report Decreased Hunger*, in clinical trials. and most of the wt loss was fat loss, not lean protien. I like that it shows women with 100% decreased appetite. Clinical studies have shown that 100% of women taking Satiereal report decreased hunger. I love that it’s all natural and had 100% positive feedback! 100 percent of women who used the product saw a decrease in appetite. That’s impressive! I learned that Fembody is endorsed by Paula Abdul. I learned that in addition to helping control your appetite, it also improves your mood and energy! This is a good thing, because I tend to get cranky when I am losing weight! I learned that it’s an all natural product. I love that it is suppose to have a 100% reduction in the desire for snacking. Though honestly, i think thats one of those statements that needs to be seen before believed. I learned that Paula Abdul is a spokesperson for it. I like that it improves your mood. I like that it improves your mood and energy level. Boy do I need that! I learned it helps to improve levels of serotin! I love that 100% of the women reported a decreased appetite and 80% reported that they lost weight. That really excited me! Slim Select 30/90 lowers LDL cholesterol!